Use the photos posted in this feature for writing prompts, warm-up activities, drawing templates or as part of a photo analysis. Aitkin County, Minnesota. Photo by John Vachon, Farm Security Administration. 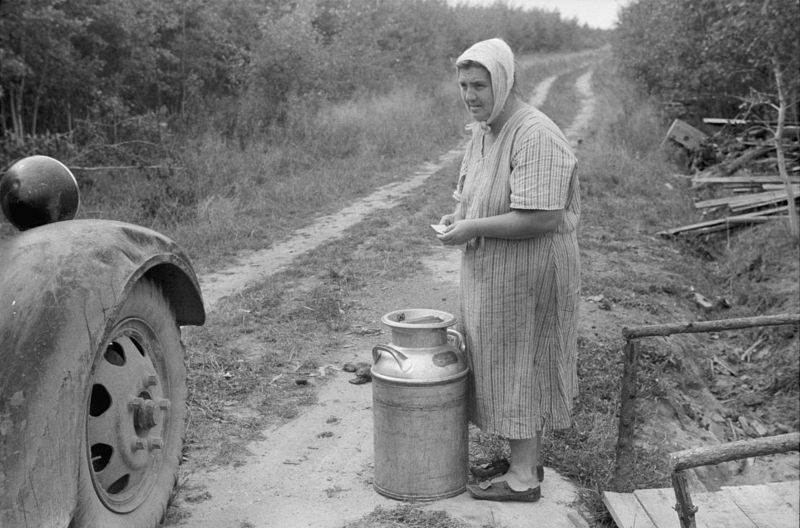 Mrs. Howard with can of milk that truck driver is calling for. Sept. 1935. “Daughter of farmer who will be resettled. Wolf Creek Farms, Ga.” Photo by Arthur Rothstein for the Resettlement Administration. June 1937. “Idle men attend the morning movies. There are three such movies in one block. 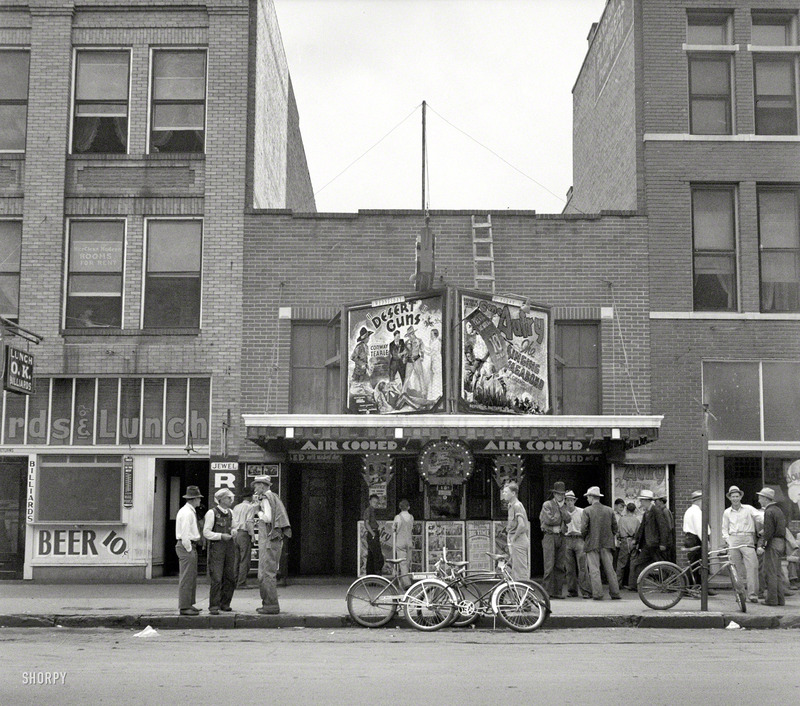 Oklahoma City, Oklahoma.” Photo by Dorothea Lange for the Farm Security Administration. June 1937. 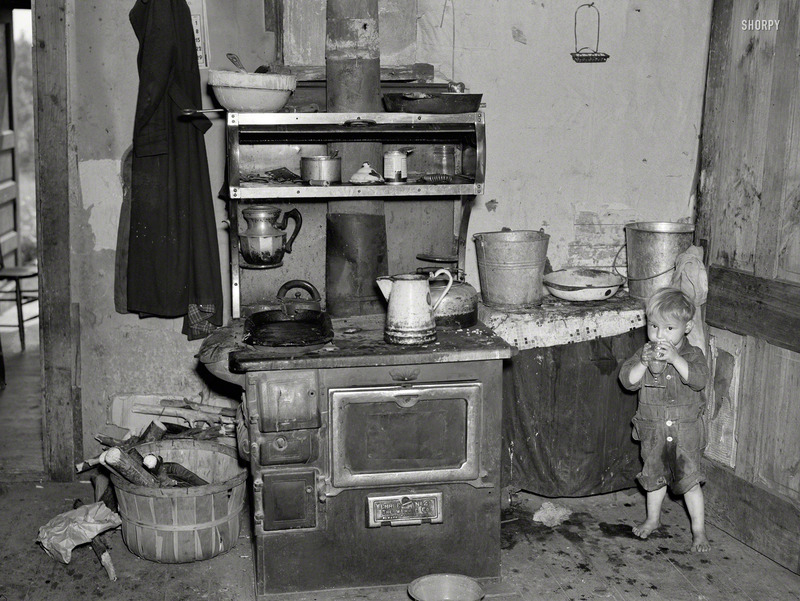 “Child of Earl Taylor in kitchen of their home near Black River Falls, Wisconsin.” Photo by Russell Lee, Resettlement Administration. Fruit tramps from California who have come to the Yakima Valley for apple thinning. Yakima, Washington. 1936 July. 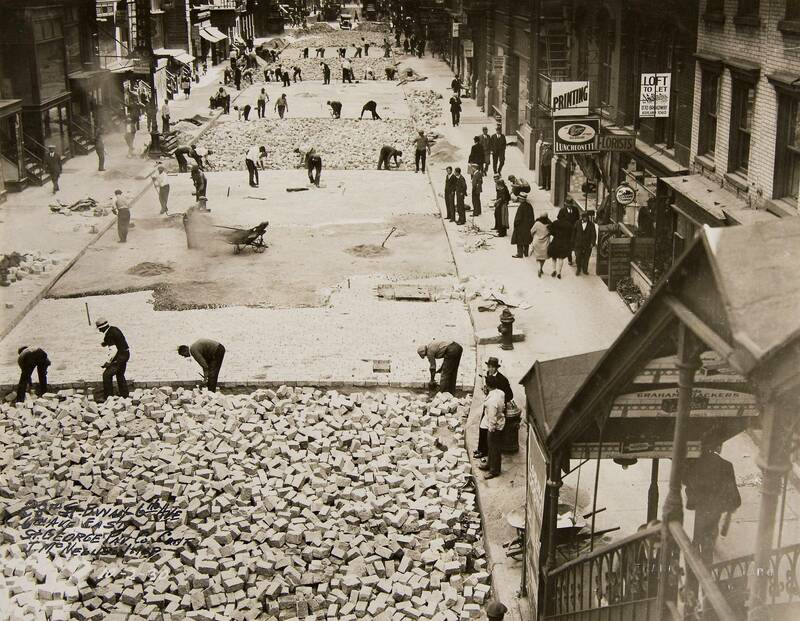 Workers in New York City work at repaving 28th Street near 6th Avenue in this photograph from around 1930. Whether you are teaching a history class covering this time period, a literature or art class covering the same, or even a media class where you might want to teach film or radio, America in the 1930s from the University of Virginia is for you. On film – The 1930s marked the beginning of the sound era in film and movies used as both escape and social commentary. Various documentaries are available to illustrate this. In Print – Look at the people, news, books, comics, and advertising of the 1930s. On Display – Examines the artwork of the 1930s and how artists contrasted the depths of the Great Depression with the coming of the machine age. On the Air – Learn how radio became the most popular form of entertainment and information in the Great Depression. You can listen to old broadcasts, ads, music or sports as well as examine the celebrity associated with this new medium. Timeline – An interactive look at each year of the decade in the areas of politics and society, science and technology, arts and culture, and world events. 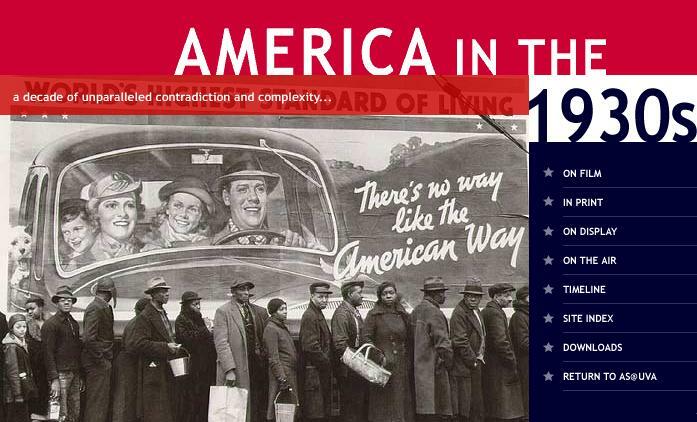 America in the 1930s is meticulously maintained and is a great source of multimedia supplements to lessons and can provide ideas for your own projects for teaching this era. Even if you are not looking purely at the history of the 1930s, showing students the perseverance and outlook of Americans in the midst of the Great Depression is an interesting and inspiring study. 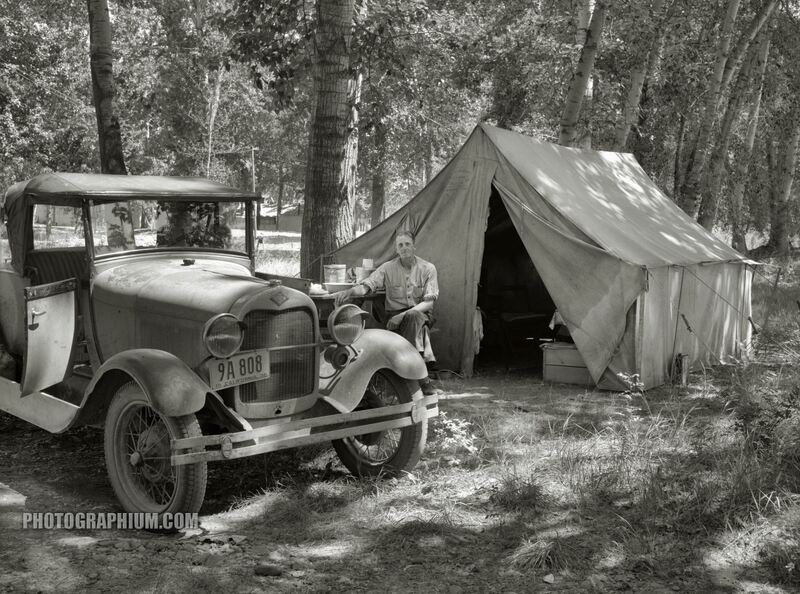 Make sure to check out the downloads section of America in the 1930s to have all your plug-ins current and don’t forget to book mark it – you’ll be back again and again!